Greensboro, N.C. (AP) — Brandt Snedeker predicted low scores at the Wyndham Championship — but not this low. Snedeker shot an 11-under 59 on Thursday, falling one shot shy of matching the PGA Tour record. He made a 20-foot putt on his final hole to become the 10th player in tour history to break 60. Jim Furyk set the record with a 58 in the final round of the Travelers Championship in 2016. This is the third consecutive year the PGA Tour has had a sub-60 round. Snedeker is the first to shoot 59 since Adam Hadwin in the third round of the 2017 Careerbuilder Challenge. It gave him a four-stroke lead after one round. Ryan Moore and John Oda shot 63s, and Martin Flores, D.A. Points, Brett Stegmaier, David Hearn, Abraham Ancer, Ollie Schniederjans and Jonathan Byrd had 64s. Snedeker — who said a day earlier that the tournament would turn into a “birdie-fest” — began the round at par-70 Sedgefield Country Club with a bogey at No. 10, and took off from there. He played the front nine in 27, including an eagle 2 on the par-4 sixth hole when he holed out from 176 yards. Snedeker, the 2012 FedEx Cup champion, won the Wyndham in 2007. He broke Si Woo Kim’s 2-year-old Wyndham record of 60 and had the best opening round in this event’s history. Arjun Atwal had a 61 in 2010. 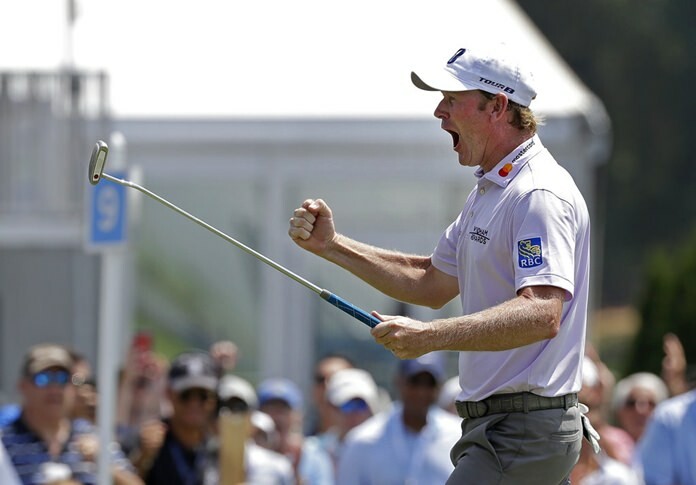 It’s been a somewhat frustrating, turbulent year for Snedeker. He has three top-10 finishes and two missed cuts in his last seven events and has not won on tour since 2016. During his first 16 tournaments of the season, he finished in the top 10 just once. At No. 80 on the points list entering the final event of the tour’s regular season, he’s nowhere near the playoff bubble and his spot at The Northern Trust next week in New Jersey seems safe. But that ranking is his lowest since the tour’s postseason format debuted in 2007. During his tie for 42nd at the PGA Championship last week in St. Louis, Snedeker says he “kind of found something” when he simplified some swing fundamentals and began to feel better about that part of his game. Then, he spent the first round showing it off. Snedeker, who began his round on the back nine, reeled off four consecutive birdies on Nos. 13-16. He then got even hotter on his final nine holes, with six birdies in addition to the shot of the day on No. 6. But he missed a 3-foot birdie putt on No. 8 that would have made a 58 possible. Moore, who won here in 2009, made a move up the leaderboard in the afternoon with five birdies in a six-hole span on the front nine. Oda, a second-year pro coming off a tie for third earlier this month in the Barracuda Championship, had three consecutive birdies on the back nine to pull even with Moore.